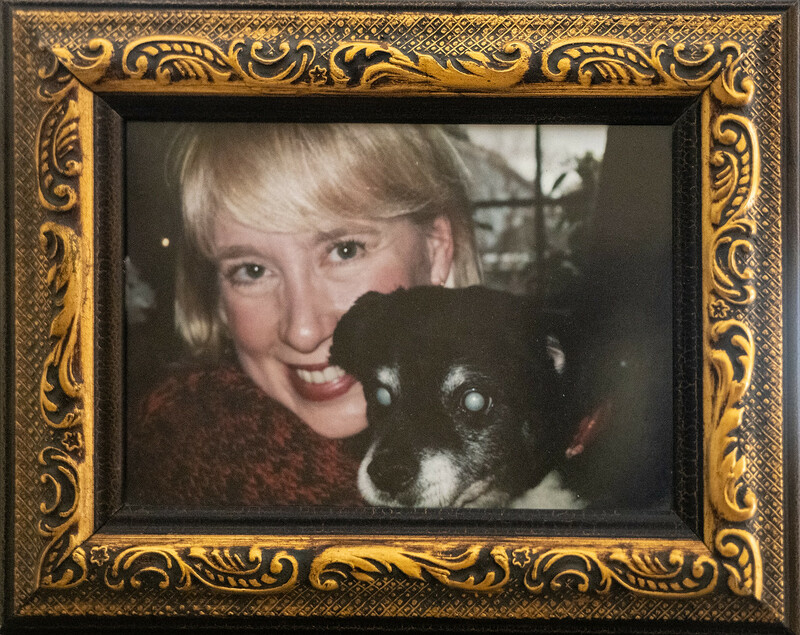 Sherri Franklin has been recognized as a CNN Hero for the senior dog rescue center she founded in San Francisco. She was a hairdresser who rescued a cat cowering under a car and took it to the SPCA. The dogs seeking attention in kennels there moved her to tears, so she volunteered to walk them 5 days a week. 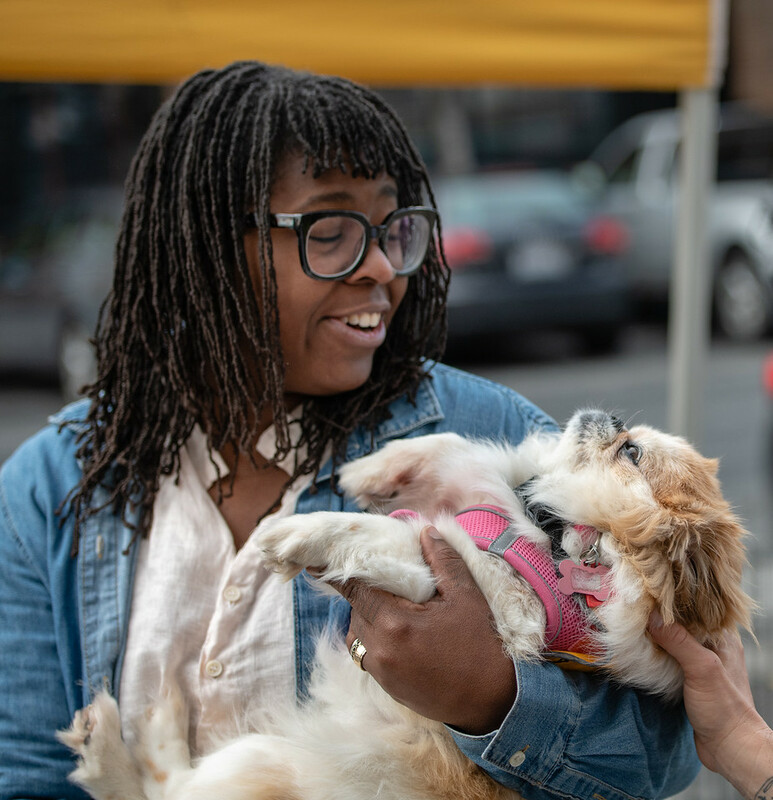 She noticed how hard it was for older dogs to find homes, so she started adopting them to offer them love and keep them from being euthanized. 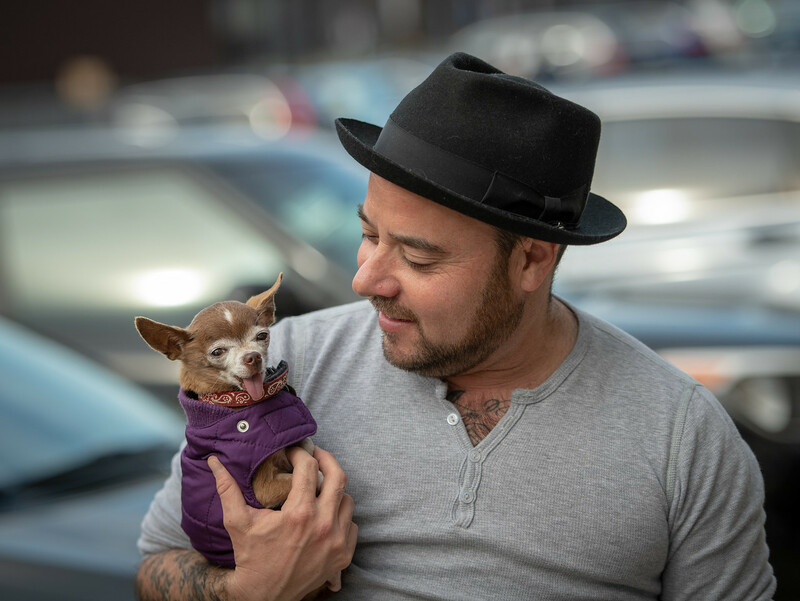 She established Muttville to give these senior dogs medical care and find loving homes; since then, the organization has rescued thousands of senior dogs and become a model rescue center nationwide. Ken & Nancy Becker have adopted 5 senior dogs from Muttville. Thanks for joining us, Sherri and Ken. Let’s start with you, Ken. 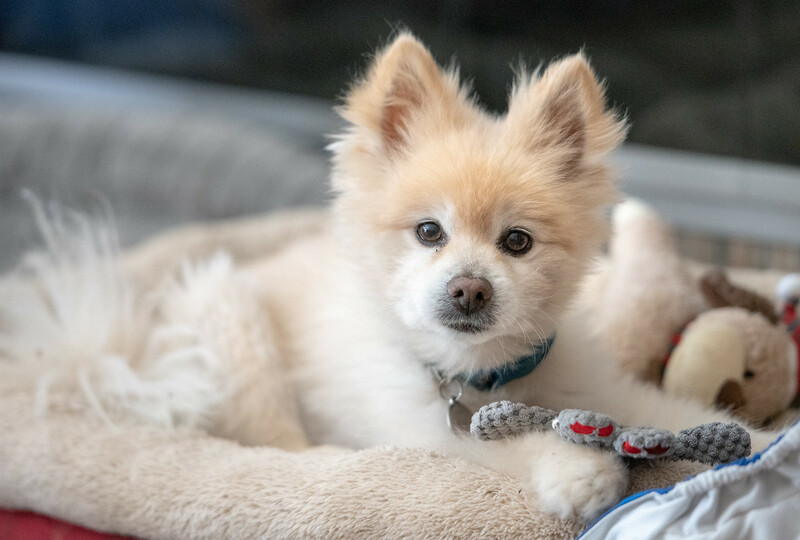 How did you and Nancy decide to adopt senior dogs? We started volunteering for C.A.R.E. (Companion Animal Rescue Effort). The first night we were there, they brought in a Shih Tzu mix that was a mess. Their concern was that this was an older dog and it would take a while to find a home for her because no one wants older dogs. We heard that and called the foster mom that very night to say we're going to take her. That was Sweet Pea. Next came a 12-year-old basset, Buffy. Her owner had gotten her as a puppy when he was 78 and he died at 90. His daughter called all the rescue centers but no one would take a 12-year-old basset. She said all her dad wanted was for her to find a home for Buffy. So we took her. We adopted Willy, about the same time, who was blind. He and Buffy went on walks together with Willy always in the lead, knowing where he was by smell. They lived with us for 6 years, until Buffy was 18. Sherri, where do get your dogs? Our dogs come from animal shelters all over California. 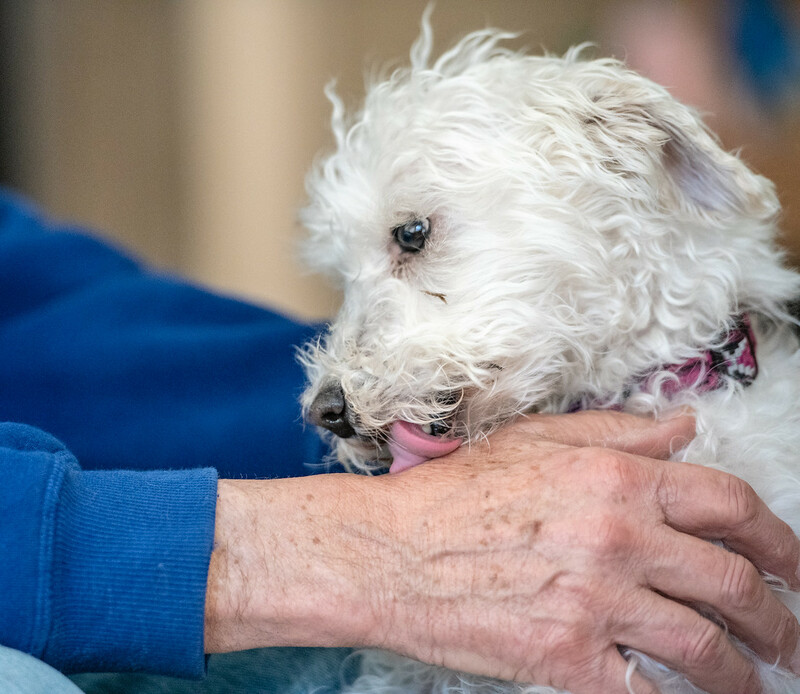 We typically take dogs when the guardian passes on, or if the guardian has gone into a nursing facility and can no longer take care of their animal for one reason or another. I would see these dogs arrive at the shelter with so much hope and joy in their eyes, and watch as it slowly disappeared. I had to do something for them. People have misconceptions about older dogs, such as that they end up here because they have behavioral issues. That’s simply not the case. They have a soulfulness and softness that younger dogs don’t have. It’s never through any fault of their own that they end up here. Tell us about the design of the shelter. Muttville is trying to change animal sheltering so when people go to an animal shelter, they don’t think it’s sad. We were the first cage-free animal shelter in the country. Whether they leave with or without a dog, they leave happy. A shelter is generally not a happy place for a dog, so we made ours like a home. Our facility has dog beds, sofas and ramps everywhere. We have a full-time vet staff and a licensed clinic. We check every dog from ear to tail to uncover any possible health issues. 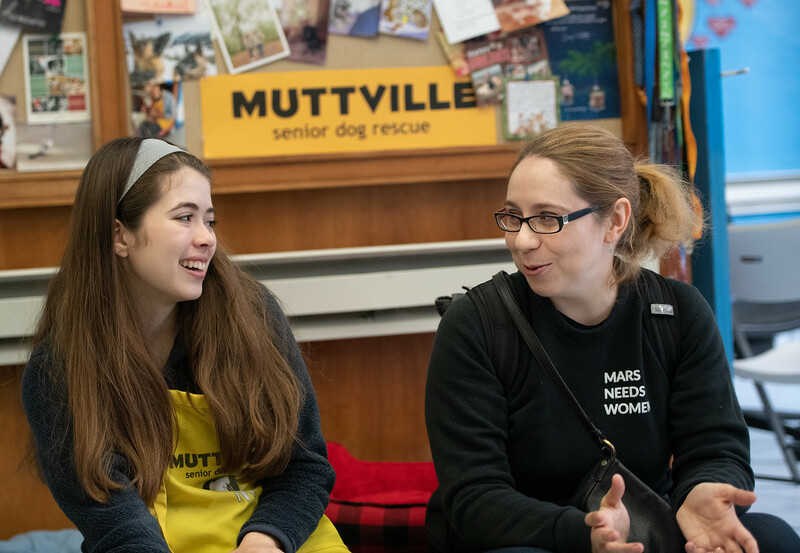 Muttville usually has about 75-80 dogs available for adoption at any one time. Most of them are in foster homes. We are not size or breed-specific. We have had 125 pound mastiffs, and 2 pound chihuahuas. The cool thing is all these dogs get homes. Ken, you and Nancy adopted a dog from Muttville with a hard past. Yes, they had a website and Nancy always looks for the dogs with the most pathetic look. She says those are the dogs that need us. 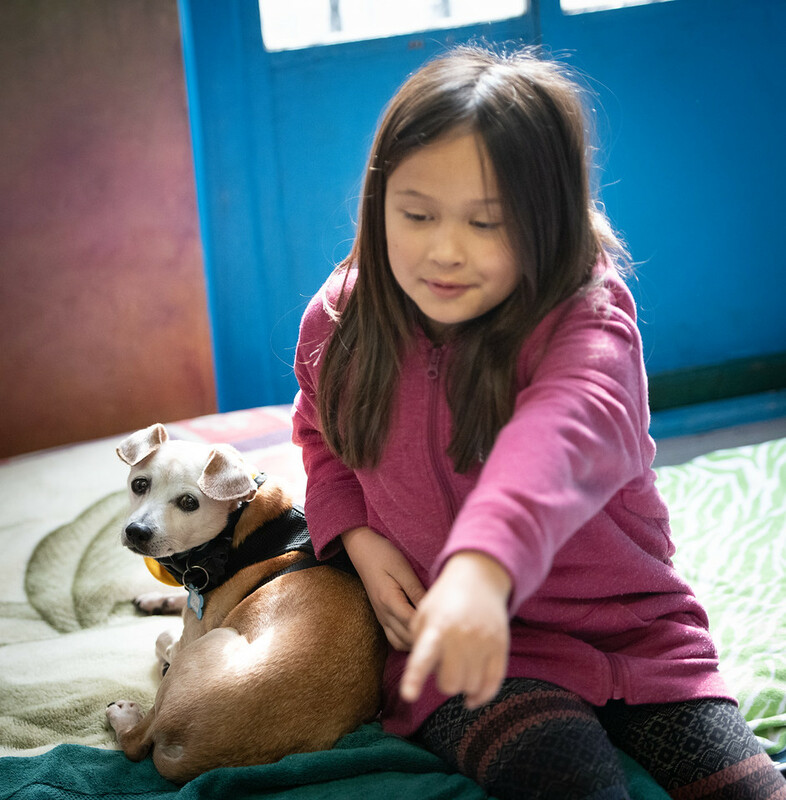 She saw Rosie, who came from the Humane Society in Salinas, 100 miles South of San Francisco. Rosie had been a mother dog in a puppy mill. She was never out of a cage in her 7 years. They didn't want her anymore, so they took her to the Humane Society. Her teeth were all rotted with abscesses in the mouth and she could hardly walk. 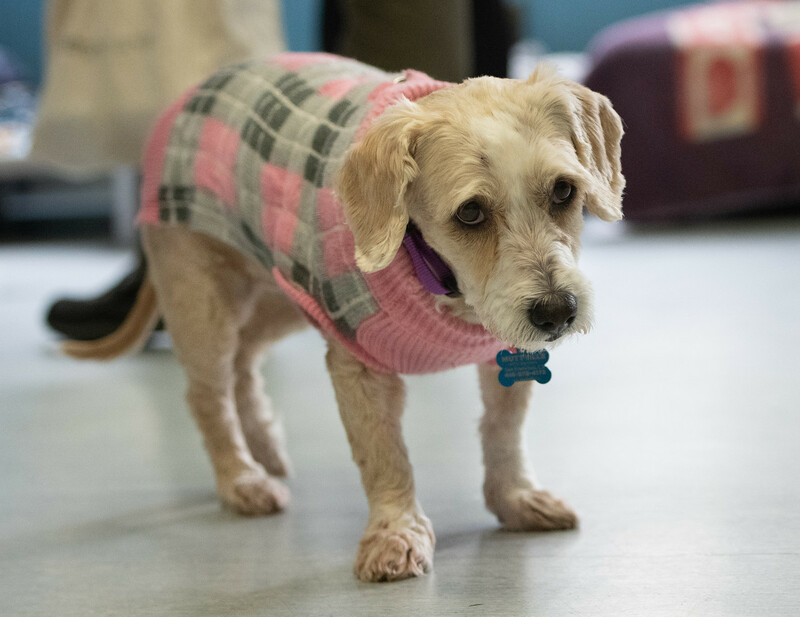 Before, the Humane Society would probably have euthanized her, but now they contact Muttville. Rosie looked awful in the picture they sent to Sherri. Sherri said yes, they'll take her. So a volunteer drove down, picked her up and brought her to Sherri's house. She was still operating out of her house at that point and working as a hairdresser. She had a lot of dogs. We called and Nancy told Sherri that the first dog we adopted from Muttville, Kirby, needed a friend. What would she think about Rosie? Sherri explained that a volunteer was coming in once a day to take Rosie to the park to learn how to walk. They had to pull all her teeth but two. Because of the weakness in her legs Sherri said they were not ready to let her go. But she promised to give us a call when Rosie was ready. In a couple of weeks we took her home. She and Kirby became inseparable. We had them for 5 years. Another misconception? Old dogs die soon. I heard today from someone who’s had a Muttville dog for 10 years. Some of them are more advanced in years, and I like to say it’s very rewarding to give one of these real senior dogs the opportunity for a last, best chapter. We have people come back time and time again, because they also agree it’s very rewarding. It fills your soul with something, because you’re able to give an animal a soft landing. 18 years is a long time for a basset to live! What do you feed your dogs? It’s a food that Sherri recommended made from barley, brown rice, split peas, carrots, sweet potatoes, bell peppers, celery, parsley, and garlic. We cook it and add some chicken breast. It smells like people food. Sherri, how many dogs sleep on your bed? I usually have 5-6 dogs that are mine. Some of them are very short-term, because I do a lot of hospice myself, and I usually have 3-4 available dogs for adoption. So I live with 8-10 dogs at any given time. Usually 6 of them sleep on the bed with me any given night! Sleeping with dogs on your bed keeps you healthy. So now you have three more dogs from Muttville, Ken: Lucy at your feet in this photo, Tilly the black one kissing you, and Tucker with the curved spine. What are their stories? We always try to have at least two dogs so they have a companion. One reason we adopt from Muttville is they have a veterinary care so we know what we’re getting because they write a complete report. Tucker was given to the SPCA at age 10 by two guys who said they didn’t have time for him. He has a curved spine. Lucy was given up at age 7 by a woman who lost her job and her house, and had to give her up. Can you imagine having to give up your 7-year-old dog? Tilly was a stray the Humane Society picked up in San Jose. They must have thought they could get her adopted because they cleaned up her teeth, but it’s hard to find homes for black dogs so they called Muttville. So naturally Nancy took Tucker and Lucy to Muttville to see the black dog, and to see if they got along. They did. Sherri, what is the best way to support Muttville? 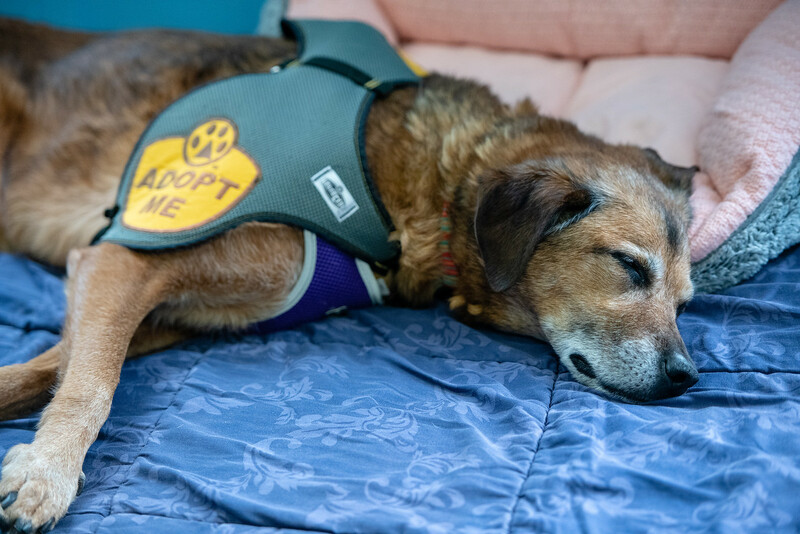 The best way you can support our organization is donating: we need sponsorships for all of our programs — our veterinary program, our hospice program, and our adoption program. We also need volunteers, adopters, foster families, and for people to spread the word and share our information to get the word out. Thanks for starting this conversation @Chris, wonderful! Sherri, Ken, and Nancy, I add my thanks to Chris's! Thank you for doing this fabulous rescue ! it is so true; senior animals get overlooked. 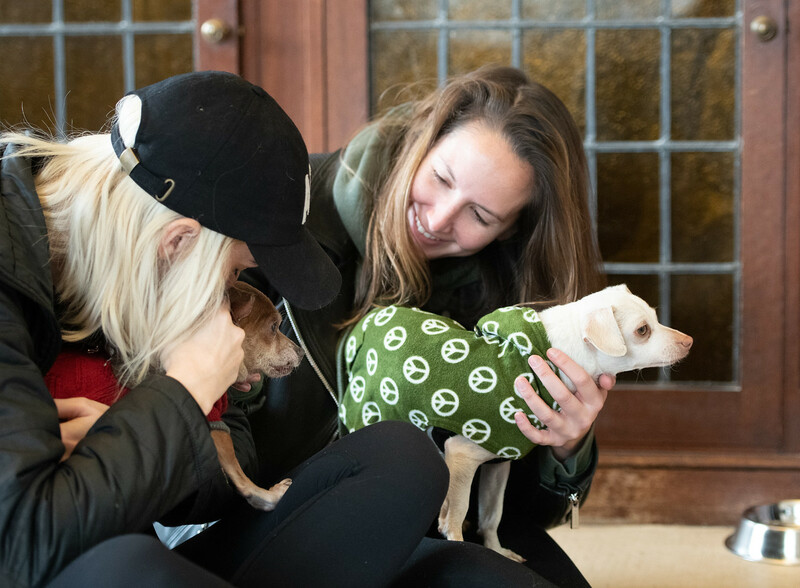 Great story about our neignbors, Ken and Nancy, and their ministry and deep love for for the 4 legged!